Multi-surface cleaning feature. You can easily switch between different cleaning modes by simply pushing a button, fast and easy! With Bissell Zing vacuum you can take care of your hardwood floors, carpets, stairs, upholstery, rugs, and bare floors. No need to change nozzles! Perfect for stairs vacuuming. Unlike most of the upright vacuums, this canister vacuum offers enough maneuvrability to assist you in maintaining your stairs. It can be used to clean vertical surfaces, such as stair risers, drapes, and walls, as well as ceilings. Telescopic wand. The wand stretches out to provide access to hard-to-reach places (such as under the furniture, ceilings, shelves, tops of cabinets, upper stairs, etc.) so you don’t have to bend, kneel, reach up or in other ways struggle to perform cleaning. Automated cord rewinding. The cord retracts automatically at the pressing of a rewind button. This feature allows you to organize the cord effortlessly when a device is not in use. Note: This is a bagged vacuum, which requires periodic replacement of bags. You need to make sure your bag does not get overfilled to ensure proper functioning of the device. On the other hand, bagged vacuums are preferable for people with allergies, since the bag is sealed and dust cannot escape during disposal. Although one of the smallest on the market, this vacuum is extremely powerful, which makes it better choice for pet owners. It cleans up pet hair and loose dirt with incredible ease and can be used to vacuum stairs just as efficiently as any other surface in the house. Interchangeable nozzles. You can easily remove and change nozzles to suit your cleaning purposes. All you need to do is to press the button to release a nozzle and then snap another one in its place in a quick and easy motion. Flexible contour nozzle. A rubber contour nozzle easily picks up pet hair on carpeted stairs, upholstery and in automobile interiors. With its help, you can reach even the trickiest places in your house. And ensure great cleaning result. Hard nozzle. This nozzle is designed to help you eliminate dry messes on your stairs, such as cat litter, food particles, etc. Its flattened shape with beveled openings provides powerful suction on most flat surfaces. It is perfect for quick clean-ups of messes felt by pets or children. Multi-level filtration system, thanks to which this vacuum can be used by people with allergies to dust, pollen and pet hair. It helps keep air clean and reduce allergens. Weighing about 4 lb this vacuum can be easily carried around and up and down the stairs causing no overstrain on your side. You can easily operate it with one hand. Multi-purpose nozzles allow you to eliminate different types of messes from your stairs. Its exceptional maneuvrability provides a perfect reach to every spot on your stairs, including stair risers, angles, and spots between banister posts. This vacuum features a Riser Visor lid, which makes it perfect for cleaning stairs. Easily shifting from horizontal to vertical vacuuming, it ensures fine cleaning results on both stair treads and stair risers. Riser Visor. This vacuum is designed with a special nozzle, which easily flips down to allow you to clean vertical surfaces of your stairs in addition to traditional horizontal cleaning. Crevice tool. In addition to a Riser Visor nozzle, this vacuum has an extension hose with a crevice tool which allows you to clean some tight areas of your stairs, such as riser base and amid banisters. Hand-held. It is quite lightweight (4.8 lbs) and can be easily operated by almost everyone. Due to its compact size you can use this item in limited space areas, where other vacuums cannot reach. Moreover, you will not have any problems finding a storage space for this vacuum. Washable dust cup. The plastic dust cup can be easily released so you can empty and clean it and then lock back into its place. 20-foot-long cord. Although this is not a cordless vacuum, you won’t experience any trouble moving with it around the house. Its cord is long enough for you to enjoy considerable mobility while cleaning your stairs. Eureka EasyClean Corded Handheld Vacuum is a compact, lightweight and relatively mobile vacuum, which enables you to perform both vertical and horizontal cleaning of carpeted stairs, upholstery and car interiors. Tip: Flip the Riser Visor knob down to enable vertical cleaning. The nobe is rather stiff, so you might need to apply some pressure on it. 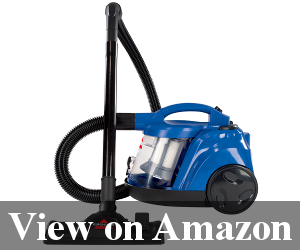 If you are looking for battery powered vacuum, this is an option to consider. Compact and cordless, powered by a 20-Volt MAX* lithium-ion battery, it is the top choice for those who need quick daily spruce-ups for their stairs or car interiors. Note: This is a bagless vacuum with a fairly large container, which can be easily emptied and washed after each cleaning. It is rather lightweight, does not take up too much space and offers a convenient cleaning on the go due to the absence of a cord. Long charging time – 24 hours. 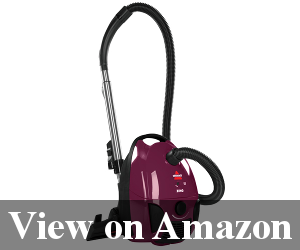 This is a versatile vacuum with a detachable canister for portable multi-purpose cleaning. You can easily switch between different cleaning modes and enjoy effective vacuuming of both hard floors and carpeted stairs. This vacuum features a unique Lift-Away technology, which allows you to lift a canister and reach tricky areas, such as stair risers, furniture, drapes, etc. Its HEPA filter ensures that dust and other allergens are sealed safely inside a container. 2 in 1 feature: you can switch between upright and lift-away vacuums for better cleaning of various surfaces. It is also known as Shark Ninja Vacuum. It is rather affordable, compact and maneuvrable thanks to its 15-feet cord. Comes with a stretch hose, crevice tool, dusting brush and a motorized brush that offers incredibly deep cleaning of carpets and stairs. This is a bagless vacuum that can be emptied of dust and dirt and cleaned very easily. Dirt Devil hand vacuum cleaner comes in handy when you need to tackle some really dirty areas, such as stairs, cat trees, pet beds, etc. It is extremely powerful and cleans up pet hair, dust, and minor debris very easily. It is an old-school vacuum, which might lack some latest features, but it is a tried-and-true helper when you need a fast and deep stairs clean-up. Warning: Larger debris can get stuck in the brush and cause a vacuum to stop and even break down, so make sure to eliminate it manually before vacuuming. This is a versatile portable vacuum for quick daily clean-ups. 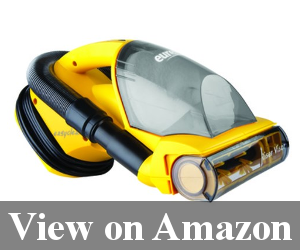 It has a compact nozzle, which makes it perfect for cleaning stairs, car interiors, around the walls, under the furniture and other hard-to-reach areas. It comes with 3 attachments, including a crevice tool and a pet brush, which works perfectly on pet hair. This is a cordless vacuum that lends you absolute mobility when doing your chores. Flexible head. Unlike most of the hand-held vacuums, which have fixed heads, this model has a stretchy hose that detaches from the body and offers a more than 4-feet extension, enough for you to clean parts of your stairs, where a bulky device cannot reach. Pet brush. This vacuum has a special brush, designed for the top pick-up of pet hair. This is an essential tool for all pet owners,since it allows you to clean carpeted stairs, pet beds, rugs, and car interiors off pet hair. Three-stage filtration system. Black + Decker is famous for its superior filtration system, which effectively traps dust, allergens, and bacteria. Lithium-ion battery. This is a powerful, fade-free battery. It does not have a memory effect, which means it can serve you for a longer period of time without losing its capacity. Home base which is also a charger. You can put the vacuum on the base and it will start charging immediately. Flip-out brush that loosens dirt before it can be sucked up in a vacuum. Note: Battery lasts for about 20 minutes. Although it might seem not enough for some, this is a normal operation time for most of the cordless hand-held vacuums. This compact portable device is an ultimate solution for quick clean-ups around the house. It might lack certain latest features, but it is versatile enough to provide effective cleaning of various surfaces, including carpeted floors, hard floors, stairs, cars, drapes, and upholstery. Motorized brush. This brush is essential for cleaning stair runners and upholstery off pet hair and other particles which get tangled in the pile. Powerful 15.6 Volt motor. Its suction power does not fade with time so you can always rely on speckless cleaning with this vacuum. Crevice tool. This vacuum has a built-in crevice tool, which easily pops out to clean under the stair nosing and in other tight areas. Built-in filter does not require replacement. It is washable and therefore low-maintenance. Bissell SpotClean Professional is one of better wet-dry vacuum cleaners that shows unparalleled performance on both carpeted floors (including stairs) and hardwood floors. The combination of wet cleaning with a solution, powerful suction and high-performance brushes produces an outstanding cleaning result all around your house. It is comparatively lightweight, and thanks to its long cord you can walk up and down the whole flight of stairs not worrying about unpluging and pluging it back in. It has two tanks (one for clean water with cleaning solution and another, for dirty water), which are large enough to allow you to cover a decent area. The main benefit you will enjoy when using this vacuum is an ability to remove stains from your carpeted stairs. Other vacuums cannot offer such an option. Tip: This vacuum can also be used to remove stains from your furniture and car seats. It comes with a 3-inch tough stain brush tool to remove deep stains and a 6-inch stir tool. Portable tanks. Both clean water tank and used water tank can be easily taken out to get filled or empties respectively, so you don’t need to use a funnel or other devices to help you manage your tanks. 22-foot-long power cord. It is one of the longest cords on the market and it can be easily organized for storage. 5-foot-long flexible hose. It allows you to reach some distant areas without moving your device. This feature comes in handy when cleaning stairs. Two types of brushes for different cleaning purposes. The hose is not long enough to provide the desired mobility. Dyson V8 Cordless is the most advanced battery-powered model introduced by the world-renowned vacuum cleaner manufacturer. In comparison with earlier version in the V-series, this one enjoys some important improvements. It has a more powerful motor, extended battery life and a 1.5 times more powerful motorized head. Portability is the main advantage of cord-free cleaners over their corded analogs. With a cordless device you can clean anywhere you need, even in places with no power outlets. At the same time, many people tend to associate cordless cleaners with less power and poorer performance. The digital motor in Dyson V8 produces suction as strong as in any other high-end corded stick or long hose vacuum cleaner. Besides, the device is powered by a Li-ion battery, which ensures stable suction until the charge dies off completely (specifically, 40 minutes in low mode and around 25 minutes in case a motorized carpet brush is attached). It is noteworthy that the device runs only when the power button is pressed, so the charge is not being wasted when you’re not cleaning. versatile combination tool for all kinds of tricky places and surfaces. Just like all other vacuum cleaners supplied by Dyson, this one is equipped with a multi-cyclonic airflow system and a fine HEPA filter to release even fresher air than the air that has been sucked in. Dyson V8 works as a regular stick vacuum, but if you need to clean upholstery or stairs, you can transform it into the handheld device. This manipulation can be done in seconds making this model much more convenient than a vacuum cleaner with detachable hand vacuum. Dyson V8 Absolute is a high-end versatile battery-powered vacuum. Basically, this is a handheld device equipped with an extension wand and floor tools. 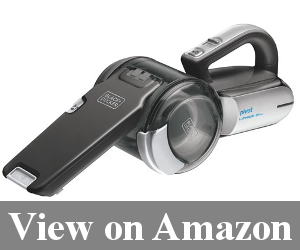 This might be a great option for those who need a portable cleaning device to perform both day-to-day pick-up jobs and deep cleaning of carpets, area rugs, hard floors and stairs. It is fairly lightweight, easy to store and handle and has impressive performance characteristics as for a cord-free vacuum. Extended battery life as compared to other models in the V-series by Dyson. Fast charging – takes only 4 hours for the device to get ready to function. The Li-ion battery ensures powerful, non-fading suction. Comes with two floor cleaning heads. Supplied with multiple attachments for all types of cleaning jobs. Features a multi-cyclonic technology (15 cyclones) that is able to capture even the finest particles. Advanced filtration system featuring a HEPA filter. A battery level indicator helps you manage the cleaning time. Converts from a stick vacuum to a handheld one in seconds. Convenient storage. The charging station is designed to be mounted on the wall, thus saving a lot of storage space and keeping the device always ready to be used. The motorized brush head does not perform well on frieze and high-pile carpets. Since the power button needs to be held down all the time to keep the vacuum on, continuous cleaning might be hard on your wrist. Works only for 25 minutes with a power brush floor tool. This might not be enough if you have large carpeted areas. Cordless handheld vacuums often come in handy when regular full-sized devices are ineffective or inappropriate. The new Bissell better hand vac pet hair eraser (cordless handheld vacuum cleaner) is one of such versatile tools. It can be used for quick daily pick-ups around the house and cleaning in tight areas, such as inside a car or in a trunk. Its Li-ion battery provides up to 15 minutes of constantly strong suction, which is usually enough for most of the cleaning tasks. The battery is removable, so you won’t have to make space for a docking station. Just like most of the contemporary cordless vacuums, this one charges to the fullest capacity in five hours. Bissell Multi is supplied with a variety of accessories to facilitate different types of cleaning. For instance, a motorized brush comes in handy when you need to remove worn-in dirt, crumbs and pet hair from carpets and textiles. Dusty shelves and drapes can be cleaned with the soft brush, while a crevice tool is designed to reach tight places, such as in between sofa cushions or in corners. The vacuum is supplied with a built-in extension hose and a wand. Although the vacuum is rather powerful, it is easy to hold and control with one hand. It weighs less than 4 pounds, so it won’t overstrain your hand, even if you have to reach high areas. When using this vacuum you don’t have to hold the button pressed during the whole cleaning session. Some amount of the charge might get wasted, but the job would be easier on your wrist. Another thing that should be mentioned is a dust cup. It is rather decent in size and has a quick-release button that makes emptying it a hassle-free job. Bissell Multi cordless handheld car vacuum is a compact, but a powerful device designed for routine cleaning tasks around the house, in the car or the garage. Pet owners might appreciate its ability to remove pet fur from different kinds of surfaces, including carpets, rugs, upholstery and pet beds. The amount of time it provides for cleaning after the full charging is rather standard and usually enough for most of the pick-up jobs it is meant to perform. Ergonomic design and lightweight construction (weighs only 3.9 pounds). A powerful Lithium-ion battery is able to provide strong, non-fading suction. In regards to suction this device is not worse than any of its corded analogs. Comes with a built-in extension hose. On-board attachments include a motorized brush to tackle the most challenging cleaning jobs. The dust bin is easy to release and empty. A removable battery can be charged from any outlet. No place for storing the attachments. A motorized brush drains the battery very quickly. Having reviewed some of the best models of vacuum cleaners for stairs we are going to proceed to analyzing them by type. Vacuums of this type are less costly and show excellent performance on carpets. Due to their configuration, they are easy to store. Their main drawback is heaviness and limited maneuverability. Canister vacuums enjoy better maneuvrability and can easily clean stairs, walls, drapes, ceilings and under the furniture. They are usually more portable than upright ones. They perform excellently on both carpets and bare floors. Such vacuums have tall bodies and are usually battery powered. They are much more compact and maneuvrable than upright vacuums. They are also light and convenient. One of their main drawbacks is a small dust bin. Such vacuums are perfect for quick daily clean-ups. They are lightweight and portable, which makes them the great solution for car interiors, stairs and hard-to-reach areas. They often come cordless, which makes them even more convenient. However, they are not suitable for covering large areas and might strain your hand if used continuously. A robotic vac is a lifesaver if you lack time for cleaning and have a large house. It can be controlled via your mobile application, making your cleaning routine as easy as possible. However, robotic vacuums do not provide deep cleaning and leave out corners, stairs and areas around the furniture. They are convenient since they don’t have a body to be carried around. However, they are expensive and require professional installation. This feature is especially important when you have more than one fly of stairs in your house. Remember, you will have to carry your vacuum around a lot as you clean your house and you will need to reach spots, which are not easily accessible. Therefore, your vacuum should be compact and maneuvrable enough to serve its purpose. Choose a vacuum which will serve as many cleaning purposes as you can think of. It is always smart to invest in a device with multiple attachments for different types of surfaces. For instance, the crevice tool is essential for maintaining stairs, so make sure the vacuum of your choice has one. Lightweight device. Unless you are a professional power lifter, you would definitely benefit from using a more lightweight vacuum. It will put less strain on your back, minimize fatigue and make cleaning as enjoyable as possible. Cord length. Opt for vacuums with long cords to ensure better maneuvrability. Cordless vacuums are even a better option for taking care of your stairs. 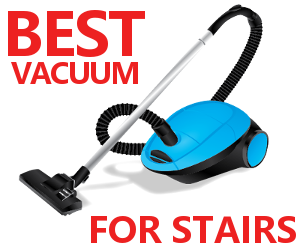 When choosing a vacuum for stairs you might want to see it as small as possible. But, consider this: the smaller the device is, the more time you will need to vacuum your stairs with it. As you can see, there is a plentiful selection of vacuum cleaners for stairs on the market. So the main thing you need to consider before buying one is your cleaning needs. It is always smart to try out a vac before purchasing it. If you don’t have such an opportunity, at least watch some top vacuums reviews on the Internet. Cleaning technologies are constantly developing and we will soon see some innovative features spread out to become commonplace. One of such trends is environmentally friendly designs, which include reduced noise, enhanced filtering systems, energy efficiency, etc. Nanophea robot vacuum cleaner, EV Cardboard VAX and dust ball robot cleaner are among the products of the future. Just stay updated on the latest offerings and look out for sales and soon you will definitely find a great bargain. Black+Decker BDH2000PL MAX Lithium Pivot Vacuum, 20-volt is the best cordless vacuum cleaner for stairs. The built-in brush makes it easy to clean hard surfaces. It’s lightweight, has 2 years warranty and the container can easily be emptied and cleaned after each cleaning. It’s totally worth the price. Talk about a good vacuum cleaner for your stairs and hard floors. Bissell 3624 SpotClean Professional Portable Carpet Cleaner – Corded is the perfect fit for your vacuuming. I love it more because it can be used to clean furniture and even car seats! Plus it can remove tough and also deep stains! Totally cool. The Dirt Devil Hand Vacuum Cleaner Classic 7 Amp Corded Bagless Handheld Vacuum Cleaner M0100 is a super amazing tool for vacuuming stairs and cars. The only thing is that I have to remember to always remove large debris that can get stuck in the brush to prevent damaging it. The cleaner is very good with pet’s fur and can be used in tight corners. Plus it’s very easy to handle. BISSELL Zing Bagged Canister Vacuum, Purple, 4122 – Corded is perfect for stairs vacuuming. It can also help with cleaning drapes, walls and even ceilings! Plus my husband had allergies and the sealed bags in the vacuum makes it safe for him to dispose the dirt without getting dusts all over him.